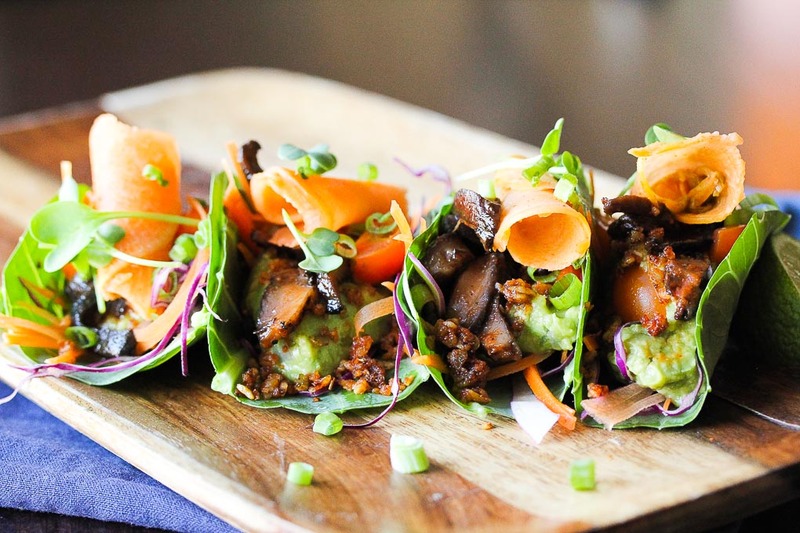 The vibrant vegetarian flavors in Korean and Mexican cuisine go beautifully together in these Raw Korean BBQ Tacos! Living and cooking in Los Angeles, one of my favorite things is the diversity of cultures and FOOD! Inspiration is everywhere. I love the contrast of sour and spicy in Korean cuisine! Tacos are everywhere these days, but I love a tasty raw version best. I have made an easy vegan version of a Korean BBQ marinade and used portabellos as the star of the dish. Instead of tortillas, collard leaves have been cut into circles for a gluten free base for these Korean BBQ tacos and there is a nut based “chorizo” as well. 1 portobello cap, gills removed and sliced into long strips. Blend ingredients until smooth, and set aside until ready to use. Process the nuts in a food processor until crumbly. Transfer to a bowl and mix in the spices, chili paste, and olive oil. Mix by hand until all the ingredients are well incorporated. With a 3"-4" ring mold or plate, cut the collard leaves into circles. Mash all ingredients together with a fork or whisk. 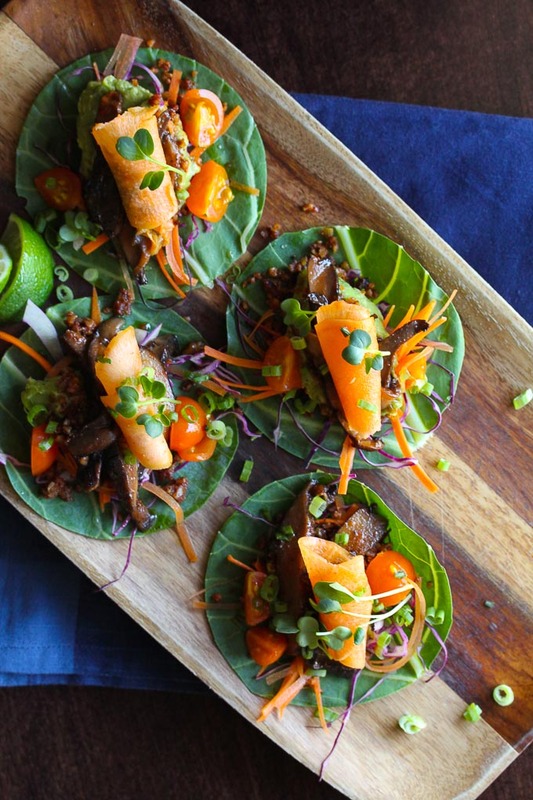 Using the collard greens as taco shells, build the tacos as desired with a little guacamole, walnut chorizo, kimchee pickled ginger and Korean BBQ marinated portobellos. Garnish with scallion, cilantro, red cabbage and lime. Hi annette! I don’t know another name for collard greens! They are a large flat leaf that is usually cooked but is great raw as well. The rolled item on top is the kim chee. Made this tonight for dinner. Over the top!!! 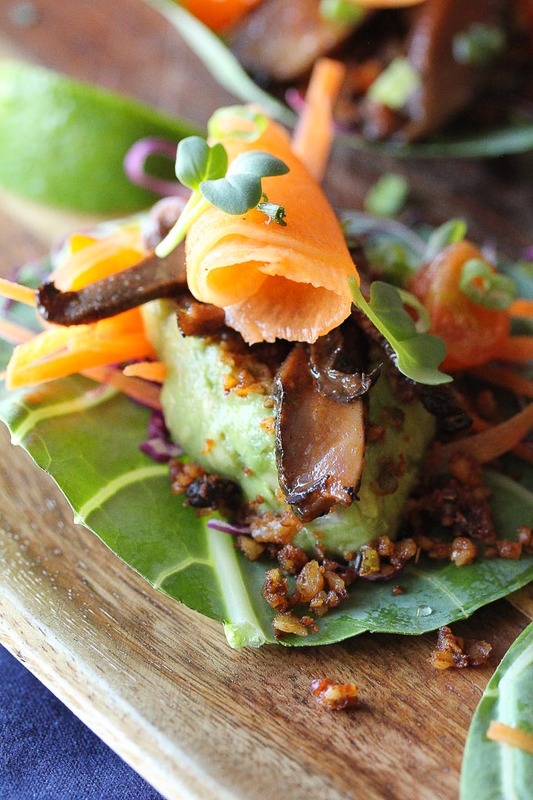 I have made other raw taco dinners before but this is the best. The Korean BBQ mushroom marinade is outstanding and the walnut chorizo is sooo good. All of the flavors blend perfectly. The only thing I would leave out the next time is the kimchee as I like to eat that by itself. Even my husband liked it. Thank you Rachel for sharing this. When you say 3/8 cup agave nectar, maple and honey, is that 3/8 cup of each or 1/8 cup?